I was so excited to get into a basket weaving class since this is something I've wanted to do ever since I was in girl scouts and we made these cute little plastic woven baskets as one of our activities. 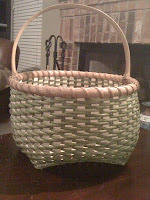 It was super easy, but I loved it and have always hoped to learn more about basket making and while at a weaving class at HCW, I found they offered classes on basket weaving and I was able to get in! The instructor, Jill, was very nice and she let us pick on her which made for a lot of laughter in class. She really knows her stuff too which helped me learn quickly. She taught me how to make the bottom quickly while the other students (not beginner's) started working. The class project was a cat's head basket which gets its name from the pointed corners on the bottom that look like a cat's head upside-down. Getting the points to take form is not particularly easy, especially for some making their very first basket, but I hung in there and eventually got it. The weaving was a twill pattern. I picked green reed. I had difficulty getting the rounded shape like the class sample, and my basket isn't perfectly symmetrical, but I'm still pleased with it. In fact, I love it. I am already signed up for a more advanced class that Jill is teaching later this month, a few days after I teach my first viking knitting class. I can't wait!